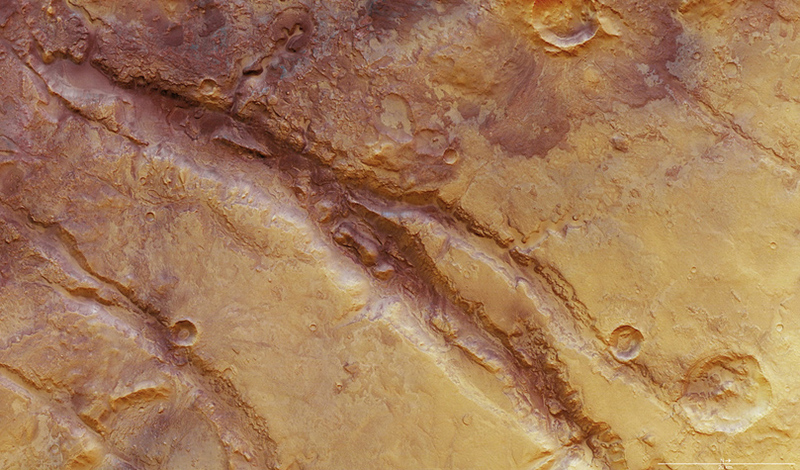 Deep gashes – called grabens – slice across the surface in the Nili Fossae region of Mars, seen above in an image from the Mars Express orbiter taken in February 2008. 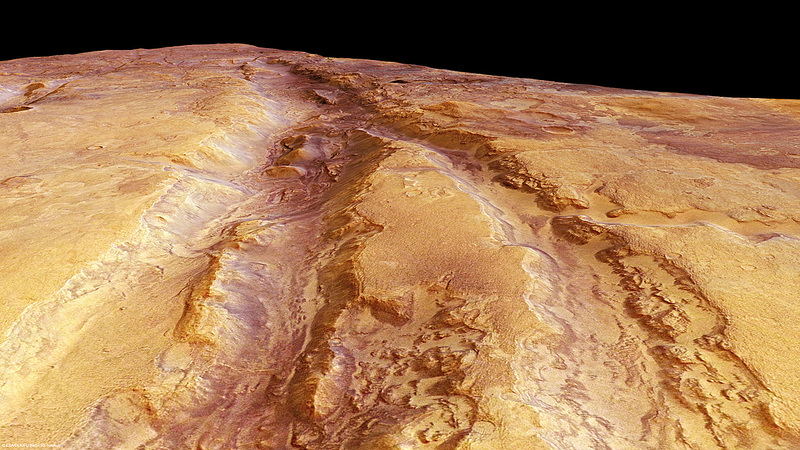 A German word meaning “ditch”, a graben is a downthrust strip of land bordered by scarps on either side. They are typically caused by extension of the surface, and in the case of Nili Fossae may be the result of the impact that created the huge Isidis impact basin where they are found…formed as the Martian crust sagged beneath the weight of the lava flows that covered the area after the impact. These channels are over 1600 feet (500 m) deep in places and have been found to contain phyllosilicates – clays that are formed only in the presence of liquid water. This is a good indication that the region was most likely covered by standing water at some point in the planet’s past. This area was once considered among landing locations for the Mars Science Laboratory rover (dubbed “Curiosity”) but had later been removed from the list for various reasons. Even now, just six months from the proposed November 25 launch date, scientists are still considering locations for the next rover. A final decision should be made by the third week of May. Even though Nili Fossae won’t be the site of Curiosity’s exploration, it’s still a fascinating location to scientists researching the possibility of water on Mars, exhibiting all the ingredients of a wetter past. Read more on ESA’s Space Science site here, and click here for a view of the area in 3D perspective.